Unsurprisingly, Aaron Judge has been invited to participate in the 2017 Home Run Derby, which will take place July 10th at Marlins Park in Miami, Florida. The rookie sensation has entered his name into AL MVP conversations and is now the favorite with Mike Trout missing a few weeks with an injury. The 6'7" outfielder would bring a whole new element of bat speed and home run distances to the annual long ball contest. Judge is not only going for the home run crown, but also trying to complete the Triple Crown, which is leading your respective league in batting average, home runs, and RBIs. He is currently in the lead or tied for first in all three categories in the AL. Judge is averaging 414 feet on his 23 bombs, including the longest of the season and in the Statcast era, a 496 footer against the Orioles. To go along with his 23 HRs, he’s got a slash line of .335/.445/.699 with 53 RBIs and 6 SBs. Judge is unsure if he is going to participate yet, but it should be noted that five years ago, in July 2012, the former Fresno State outfielder won the College Home Run Derby at TD Ameritrade Park in Omaha. Joe Girardi also was asked about the possibility of Judge being in this year’s derby and seemed to approve of the idea. He stated he didn’t think it would affect Judge’s swing at all for the rest of the season and that he watches Judge launch homers to all parts of the field in batting practice. Judge’s 2,631,284 All-Star votes are the most in the AL and second in all of baseball behind Washington’s Bryce Harper. 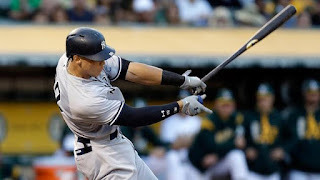 It is all but guaranteed that Judge will be playing in the All-Star game and now, we can imagine a Home Run Derby final of Aaron Judge and the guy he’s been compared to, reigning champion Giancarlo Stanton.